The materials on this web site have been prepared by Miller, Monson, Peshel, Polacek & Hoshaw for general information only and should not be acted upon without advice from legal counsel. 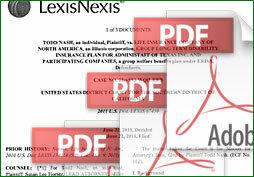 This information is not intended to and does not create a lawyer-client relationship. We also provide links to other web sites for your convenience, but such sites are independent and we have no rights in, control over, or responsibility for those sites. Some of those linked sites themselves contain material which is protected by copyright or other laws, and we make no claim to any intellectual property reflected in those linked sites. Because email messages sent between you and Miller, Monson, Peshel, Polacek & Hoshaw (“MMPPH”) and its employees are transmitted over the Internet, MMPPH cannot assure that such messages are secure. You should be careful in transmitting information to MMPPH that you consider confidential. If you are uncomfortable with such risks, you may decide not to use email to communicate with MMPPH. Although you may be sending an email message to a specific MMPPH employee, other MMPPH employees may review such messages. Additionally, your email messages to MMPPH may, consistent with MMPPH’s regulatory requirements and retention polices, be retained. You should also be aware that email messages may be delayed or undelivered. If there are any problems regarding reception of e-mail messages originating from MMPPH, or attachments contained therein, please call our office at (619) 239-7777. The e-mail message is intended only for the use of the individual or entity to which it is addressed and may contain information that is privileged, confidential and exempt from disclosure under applicable law. If the reader of the message is not the intended recipient, or the employee or agent responsible for delivering the message to the intended recipient, you are hereby notified that any dissemination, distribution or copying of this communication is strictly prohibited. If you have received this communication in error, please notify us immediately by telephone, and delete this transmission with any attachments from any computer, or electronic device and destroy all copies in any form. Thank you.